A quick hop and a skip and you’re in Venice headed to check out a new restaurant opening engineered by the mastermind behind 11 of the most successful restaurants in Los Angeles- Paul Hibler. His newest venture located at 1900 S. Lincoln Blvd., Superba Food & Bread, is supposed to be an offshoot of the highly popular, Superba Snack Bar. but the name makes it sound more like a high end grocery store. Superba Food & Bread is situated on the corner of Superba and Lincoln Boulevard in Venice. You just might miss the place if you’re cruising down the street looking for it in the midst of a shopping plaza because there is none. 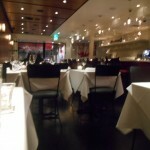 In fact, Superba is located in a primarily residential area. There is no culinary competition in sight. You are fairly surprised when you notice that the parking lot is full during the lunch hour, which is odd less than a week after its grand opening. In fact, the doors that lead into Superba are revolving non-stop, attracting a crowd that looks like they were hand-picked by Central Casting. The casting ad must have read: attractive casual beach walkers with no worries. Who are these people? Did they all just come from wardrobe? Are they giving away free food? How did Paul Hibler make this happen- again? You look to your left and you wonder why there are people lounging outside the restaurant on the patio area pecking away at their laptops as though this is what they do every afternoon. This restaurant has just opened, there is no way they could have regulars already. Once inside you’re surprised to see a recasting of the O.C. serving customers wearing light colored denim casually covered by aprons that look like potato sacks. 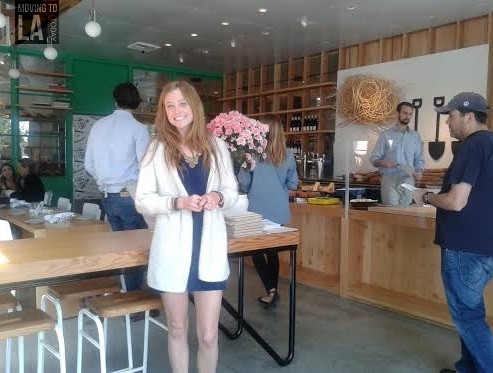 Superba’s version of Mischa Barton flashes an earnest smile as she leads you to your table. You are offered water from a glass jar poured into a tiny glass cup and you feel fancy as you lift a pinky finger to take a sip and survey the space. The lighting fixtures hang down like icicles from the ceiling but they aren’t turned on during this mid-day rush. Instead, the room seems to be illuminated by the sparkling sun, its rays bathing every customer in warmth as they chat, giggle and nibble on a variety of breads, salads and pastries. Whoa. There is a lot going on in here. The kitchen is behind glass walls, making the milling going on in the kitchen seem like it is a part of the dining room. Then there’s a coffee bar serving every trendy, caffeinated refreshment you can imagine with prices starting at $3. There’s a line of patrons waiting at the counter salivating over the fresh baked breads and pastries. You can’t help but smile, feeling like you’re finally a part of the “in” crowd as you sit up tall and take on the task studying the menu. Your concentration is broken as your body sways to the sound of Nick Ashford and Valerie Simpson’s 1966 classic Ain’t No Mountain High Enough, pulsing in your ear. Before you know it, you’re singing along to, “I wanna put on my, my, my, my my Boogie Shoes” by KC & The Sunshine Band and you realize the only thing missing from this restaurant is a microphone and a spotlight. Superba has the vibe of Louie’s in Downtown LA, yet it offers a much more palpable sense of joy. You make your food choices and when they arrive you’re impressed by the presentation. The rotisserie chicken salad, recommended as a house favorite, is light and satisfying. You’re feeling adventurous so you try the toast covered with what the menu calls kaya. It looks a bit like artwork on bread but you take a bite and immediately want to ask the baker out on a date. In fact, there should be a law against this flavor; it’s sweet and smooth yet has a tangy bite to it. You don’t know what it is because you’re not a chef and you’re both delighted and horrified because you experience a sudden wave of guilt. Nothing this good can be low calorie. You forgive yourself in advance for your sins before you eat both pieces of toast, the kaya spread dancing on your tongue. You rationalize that your gym membership is still valid and life must go on. You’re not done yet. The salmon belly BLT has arrived. More bread. You know you’re being bad, but on this day, being bad is good. One bite and your toes curl. Literally, whoever thought of putting salmon together with bacon, soft warm bread and whatever special sauce they have on this sand which should receive a medal of honor. 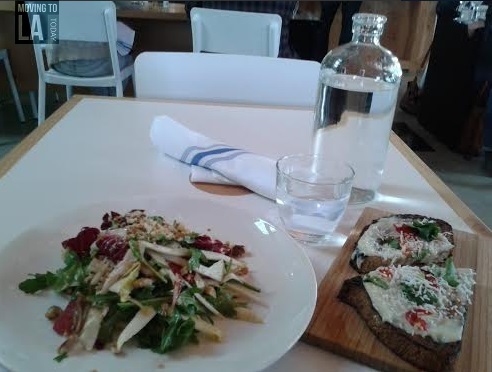 Your visit to Superba Food & Bread was more than a lunchtime treat; it was a reward. You deserve it.